Mutations of the alkaline phosphatase (ALPL) gene in the liver, bone and kidney can cause hypophosphatasia (HPP) and early-onset bone dysplasia, asserting its key role in human bone development. Despite its importance, its mechanism of action during bone ageing is largely unknown. In a recent study published in Bone Research, Wenjia Liu and co-workers at the Xi'an Institute of Tissue Engineering and Regenerative Medicine demonstrated that the knockdown of ALPL gene induced premature bone ageing characteristics, including bone mass loss and marrow fat gain. The phenomenon was coupled with impaired mesenchymal stem cell (MSC) differentiation. The scientists then reactivated the pathway using the diabetes drug metformin to restore the ability of stem cells to grow and differentiate into bone-producing osteoblasts and prevent bone ageing. The MSCs are precursors of bone producing osteoblasts and the protein encoded by the ALPL gene is enriched in the stem cell membrane, with involvement in ATP metabolism during cell differentiation. Liu et al. determined the mechanism of bone ageing with loss-of-function studies, where ALPL deficiency in stem cells enhanced the release of ATP, while reducing its hydrolysis to cause extracellular ATP boost. The ATP when internalized by MSCs inactivated the AMPKα cell signaling pathway (master regulator of cellular energy homeostasis), contributing to MSC cell fate switch by impairing their ability to grow and proliferate. The work was conducted in vitro and in a mutant mouse model (Alpl+/-) exhibiting premature ageing, followed by metformin treatment to improve the function of endogenous MSCs by reactivating the cell signaling pathway. Alkaline phosphatase (ALP) was initially identified in 1912 as a ubiquitous ectoenzyme widely distributed in nature from bacteria to humans. ALP is a well-known osteoblastic marker used as a diagnostic index to detect the bone forming capacity in osteoporosis. Genetic studies investigating ALPL in humans and mice strongly implied the necessity of the gene in postnatal bone formation and that bone deformities were related to the degree of ALPL deficiency. Although the function of ALPL was established in bone development, its role in bone ageing remained unknown. Bone ageing is the primary contributor to osteoporosis that also results in decreased bone mass and increased fat. Bone marrow mesenchymal stem cells are common progenitors of osteoblasts and adipocytes, undergoing senescence at the cellular level during bone ageing. Previous studies showed that rescuing the function of MSCs had significant therapeutic impact on ensuing regenerative capacity and bone mass. Yet, how ALPL orchestrated the differentiation and senescence of MSCs to affect bone ageing has remained elusive. In the present study, the authors focused on the expression of ALP alongside tissue non-specific ALP (TNSALP) that is encoded as a cell surface marker to identify and isolate bone-forming stem cells. The combined expression and activity were detected using ALP activity assays, western blotting and immunohistochemistry in ageing mouse models. The scientists showed that bone ageing was associated with decreased Alpl expression in the bone marrow. The authors used gene knockout mouse models to investigate the regulatory role of Alpl in bone ageing (Alpl knockout: Alpl+/-). Relative to the wild type group, the knockout mice showed nearly 50 percent reduction in serum ALP activity and mimicked premature bone ageing, accompanied with age-related bone mass loss and marrow fat gain. The study further showed that in MSCs, Alpl prevented bone ageing sensitivity by specifically regulating senescence and cell differentiation to govern the osteo-adipogenic balance of bone marrow stem cells. Since the study showed that both Alpl and AMPKα pathway regulated the function of MSCs, metformin, a common activator of the AMPKα pathway, was introduced. Metformin is commonly known as a first-line drug used to treat type 2 diabetes, recently used as an anti-ageing drug while successfully extending the longevity and lifespan in experimental mice. Metformin treatment prevented bone ageing in Alpl+/- mice. 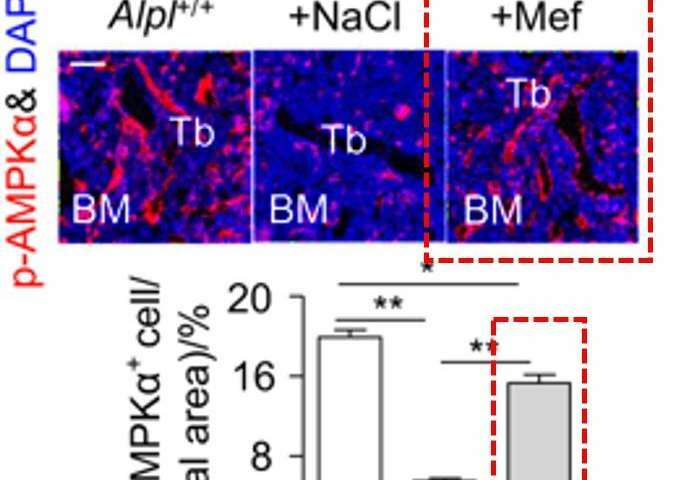 Metformin (60 mg/kg) was injected into the femoral bone marrow cavity of 4-month old mice, comparing the wild type (Alpl+/+) and mutants (Alpl+/-) with NaCl used as a control. Immunostaining analysis showed the expression of p-AMPKα (red) and nuclear staining (blue, DAPI). Quantification of the observation is indicated in the bottom panel. The AMPKα pathway was reactivated via metformin administration in the Alpl-deficient mice. Credit: Bone Research, doi: 10.1038/s41413-018-0029. In the study, metformin demonstrated a stronger capacity to rescue the differentiation in knockdown MSCs in vitro and in knockdown mice in vivo, compared to the alternative therapeutic potential sought via the overexpression of the Alpl gene. Specifically, injections of metformin into the bone marrow cavity successfully rescued the impaired function of endogenous MSCs, while preventing premature bone ageing in the Alpl+/-mutant mice. 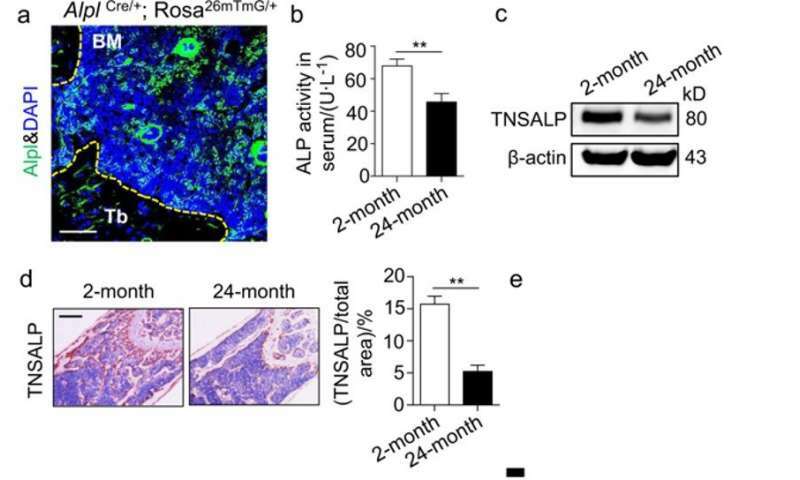 Collectively, the authors revealed a previously unrecognized role of Alpl gene in the prevention of bone ageing, with ATP-mediated functional alterations in MSCs and the potential of metformin treatment as an effective therapy in Alpl-deficient bone ageing. Future mechanistic studies at the cellular level will explore how Alpl regulates the ability of MSCs to release ATP and the broader impact of Alpl-deficiency on other organs.